Rising Son GS - With over 25 years of experience fishing the Pacific Northwest, Jacob Munden will guide your family friends, and colleagues on a fishing adventure of a lifetime! High quality tackle, local expertise, USCG licensed and insured, guiding for Salmon, Steelhead, Sturgeon and Walleye. On a trip with Jacob, you can expect to not only catch fish, but to learn throughout the day. Happy New Year from Munden's Rising Son Adventures! 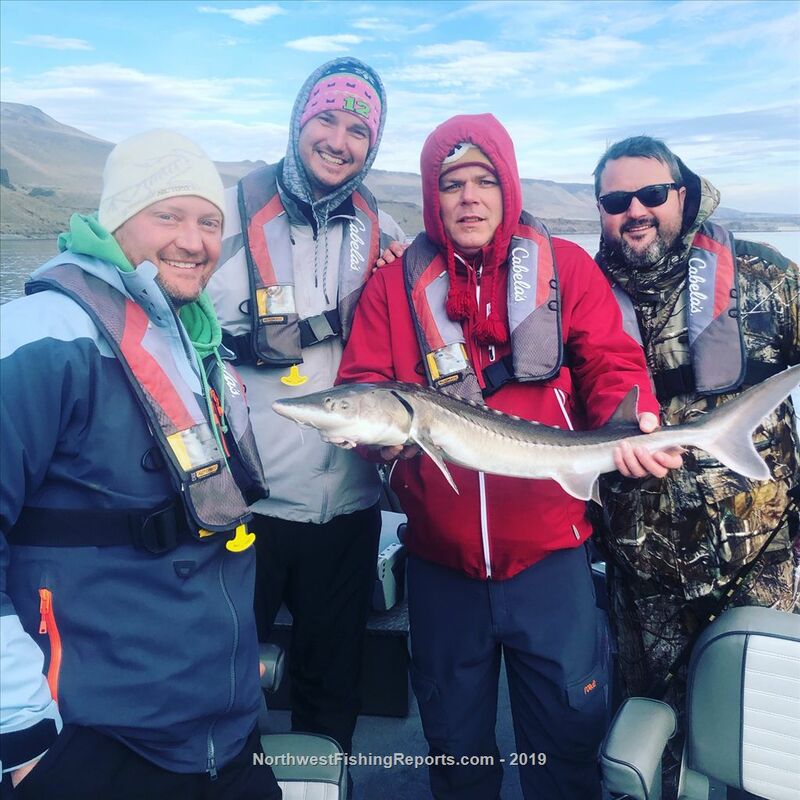 We started the new year out with Keeper sturgeon fishing in the John Day Pool. Unfortunately, the fishing was not good and the pressure was as busy as I have ever seen it. I think with the lack of steelhead fishing opportunities in this region, people were eager to get on the water and wet a line. We fished for two days and got a total of 6 sturgeon. None were in the keeper size range, however. Other pools down river had better success. I have a few theories as to why the John Day Pool is so tough anymore, while the other pools do better. I will save that discussion for another day. Regardless, I can safely say the John Day Pool quota was not hurt very much for this opener, so get out there and give it a shot! There are fish around and you can't catch them at home! We will be switching gears to steelhead to finish out January and then it is show season. I will be doing a Columbia River Salmon seminar at the Tri-Cities Sportsman show at 4 pm on the 19th of January. I will also be working with Brad's Killer Fishing and Fish Fighter Products at the Puyallup and Portland Sportsman shows coming up in late January and early February. Come by the booths, find me, and book your 2019 trips at the shows and get a special show discount! We look forward to seeing you there! High quality tackle, local expertise, USCG licensed and insured, guiding for Salmon, Steelhead, Sturgeon and Walleye. On a trip with Jacob, you can expect to not only catch fish, but to learn throughout the day. View other reports from Rising Son GS. You're hanging out in the NWFR booth in Tricities aren't you? Yep I am for sure on Saturday.